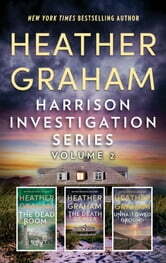 Return to the thrilling world of Harrison Investigations. Before the Krewe of Hunters, there was Adam Harrison’s PI firm. 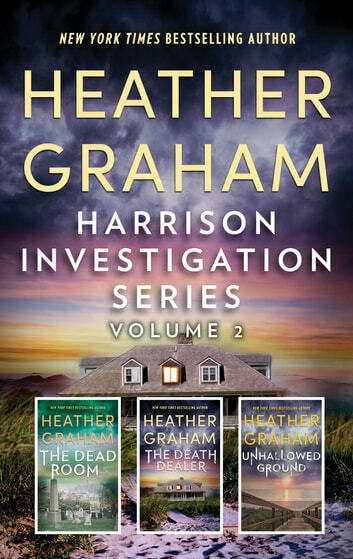 Available for the first time in a value box set, stories 4 - 6 in the series—classic paranormal romantic suspense from New York Times bestselling author Heather Graham. A year ago, archaeologist Leslie MacIntyre barely survived an explosion that took the life of her fiancé. Since then she’s slowly come to terms with both her loss and an unsettling ability to communicate with ghosts, a “gift” received in the wake of her brush with death. Now she’s returned to lower Manhattan, site of the explosion, to investigate a newly discovered burial ground. In this place restless spirits hold the secrets not only of past injustice but of a deadly conspiracy against the city’s women—including Leslie herself. Genevieve O’Brien’s knows all about nightmares. She survived two months as a psychopath’s prisoner, and now a new menace stalks the city. She turns to PI Joe Connolly, her past rescuer, friend and…hopefully something more, if he would just quit avoiding her. At first Joe isn’t sure there is a case. But the body count rises, and it’s clear that a twisted killer is on the loose. Even more unsettling is the guidance he starts receiving from beyond the grave, warning of some terrible danger ahead. But can even the spirits stay the hand of a madman bent on murder? When Sarah McKinley is finally able to buy the historic Florida mansion that she has always loved, she dismisses the horror stories of past residents vanishing and a long-dead housekeeper who practiced black magic. Then, in renovations, she makes a grim discovery: hidden within the walls are the remains of dozens of bodies—some dating back over a century. The door to the past is blown wide open when Caleb Anderson, a private investigator, shows up. He believes several current missing-persons cases are linked to the house and its dark history. Soon Caleb begins to fear that if he can’t stay a step ahead, he could lose Sarah to a killer with an ability to transcend time in a quest for blood and sacrifice.